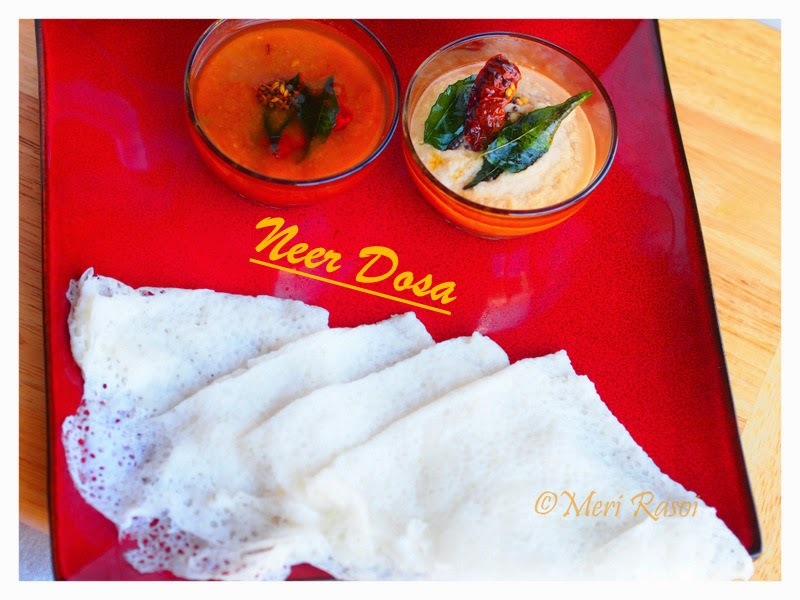 The word "Neer" means water and hence Neer Dosa literally means Water Dosa. Its called by this name because the batter which is made from rice has a very thin consistency just like water. It is very easy to prepare . Rice is soaked for a good 4-6 hours and then ground with coconut to form a thin batter. 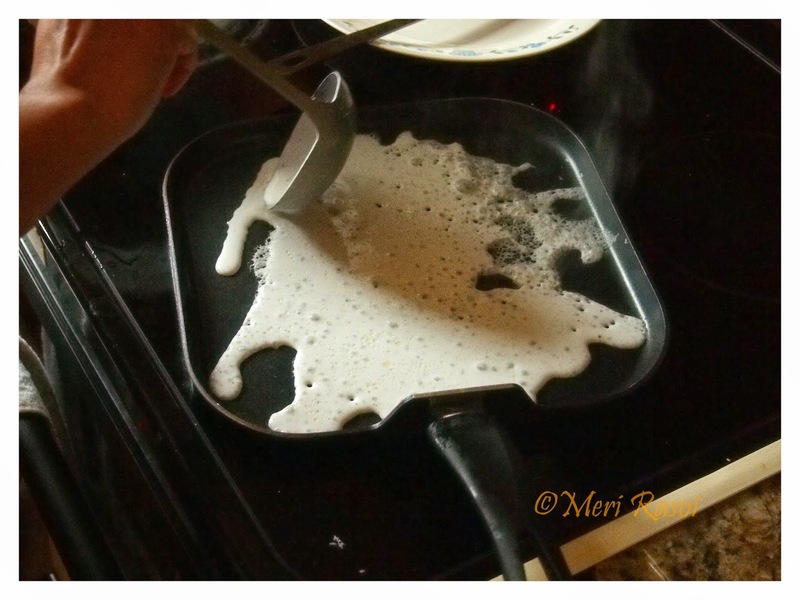 This batter is then spread on a hot griddle to form thin Rice crepes. This popular Mangalorean breakfast is served with spicy coconut chutney . Personally, I love eating this lacy dosa just with powdered jaggery. 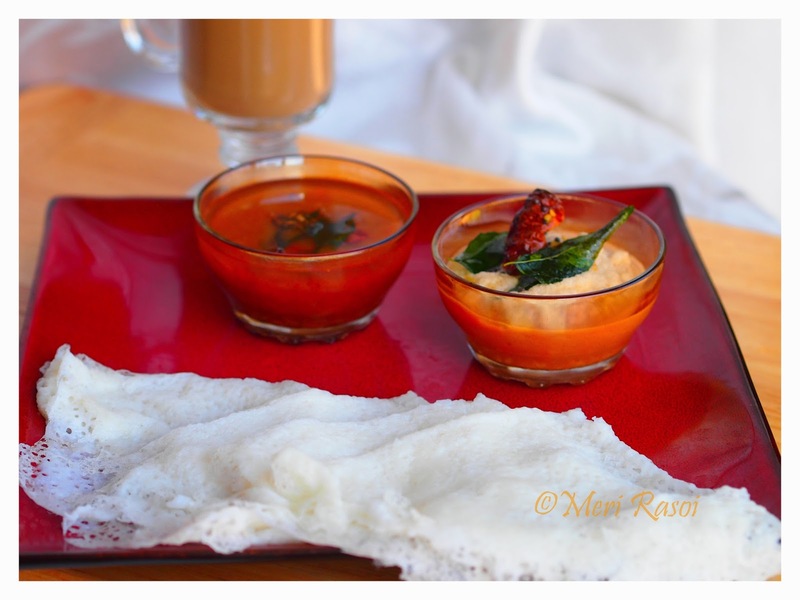 Neer Dosa is not only delicious and light on the tummy but GLUTEN FREE too. 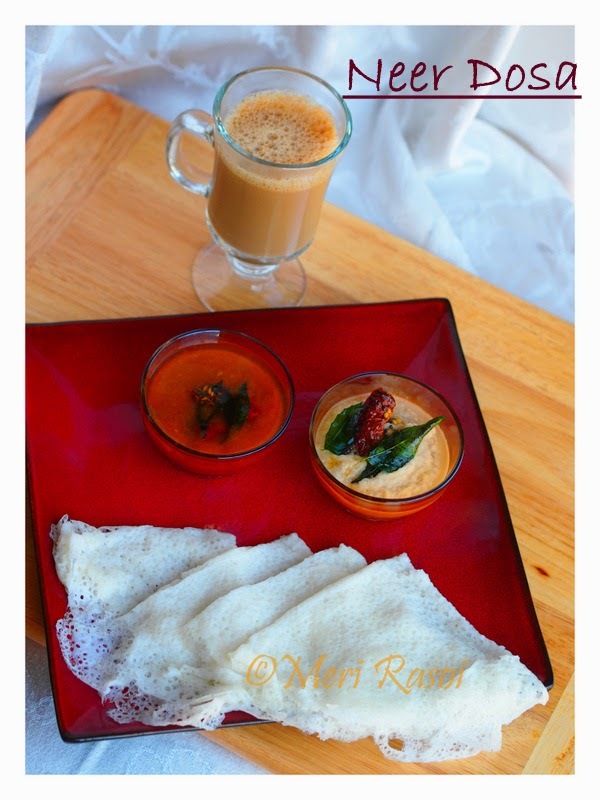 Though this dosa is very easy to prepare, you need to keep few things in mind. The batter should be very thin. If the batter is thick , then the dosa will have crack on its surface. 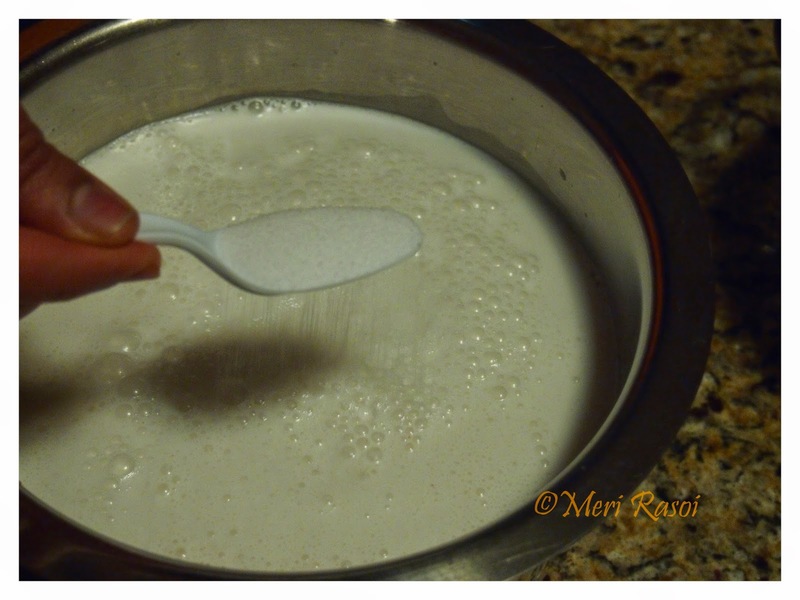 To check the consistency of the batter , dip the back of the spoon into the batter. If the batter coats the back of the spoon lightly then the consistency is right. Also the temperature of the dosa pan should be very high. I add some oil to the batter itself and hence I didn't add any further oil while preparing the dosas. Also to make things easier , i used a non stick pan:) Another thing to note is, the more you soak the rice , softer the dosas will turn out. So it would be advisable to soak the rice overnight. If you are pressed for time, then you could soak the rice of 2 hours in hot water. Grind the rice with the grated coconut using little water. 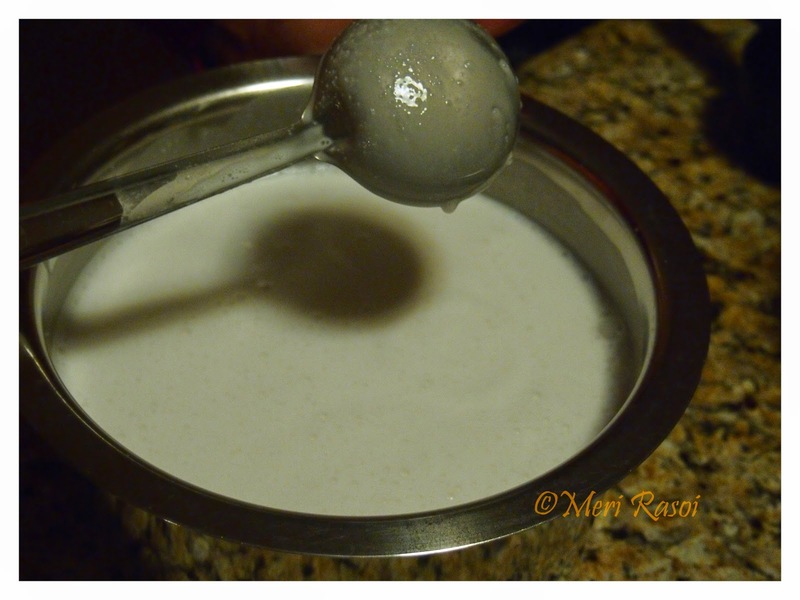 Once the rice -coconut mixture has been finely ground ,transfer it to a mixing bowl. 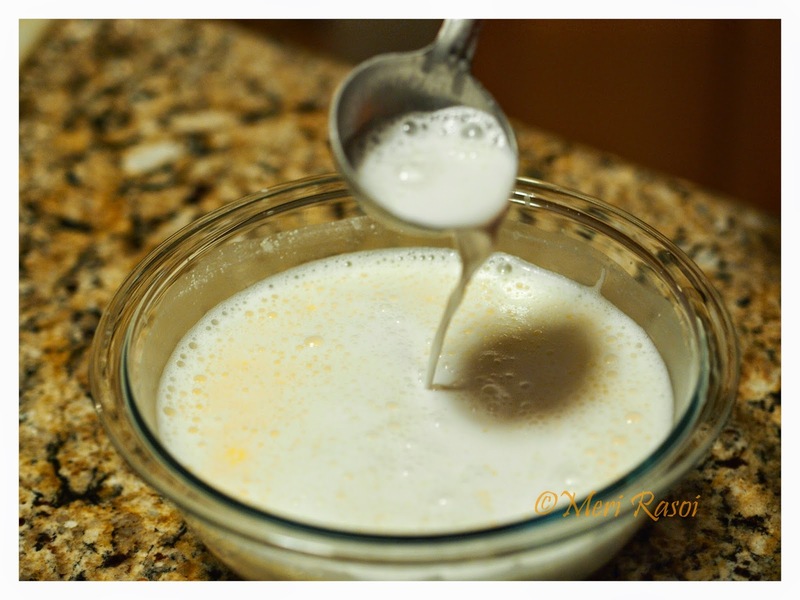 Add water so that the batter becomes thin just like butter milk. The consistency of the batter should be such that the batter has a very thin coating at the back of the spoon and not a thick coating. If if forms a thick later, then the you need to add a little more water. I added approximately 3 cups of water in all. Add salt as per taste. Also add the oil to the batter. Instead of adding oil every time while preparing dosa, I have added the oil to the batter itself. Heat a non-stick pan. 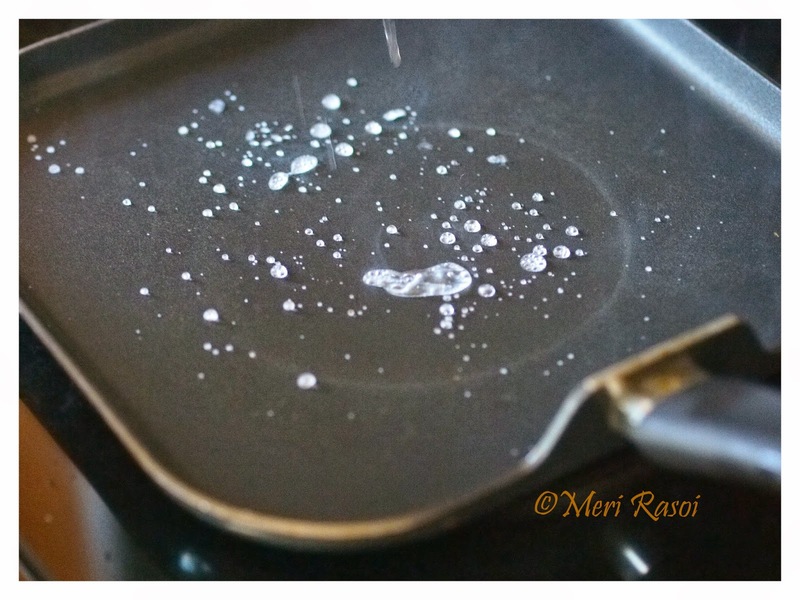 (I prefer using the nonstick pan over the iron skillet). Do the sprinkle test . Sprinkle few drops of water and if water droplets sizzle and evaporate within few seconds,heat is just right.Proper heating of pan is very important.Keep the flame high. 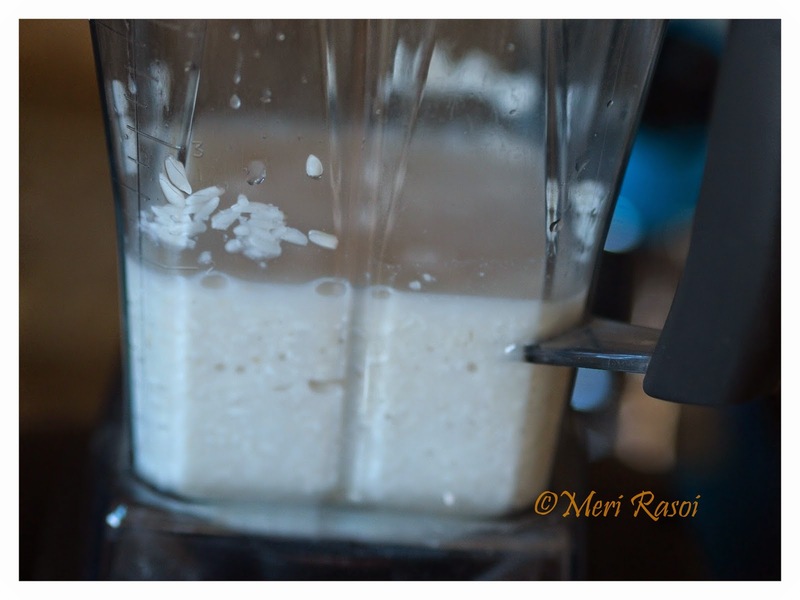 It is important to mix the batter well every time you make dosa. Take a laddle of batter and start pouring from the sides of the pan. Holding the handle of the pan in the other hand , start swirling the pan so that the batter evenly spread through out the pan. Fill in the gaps using some extra batter. 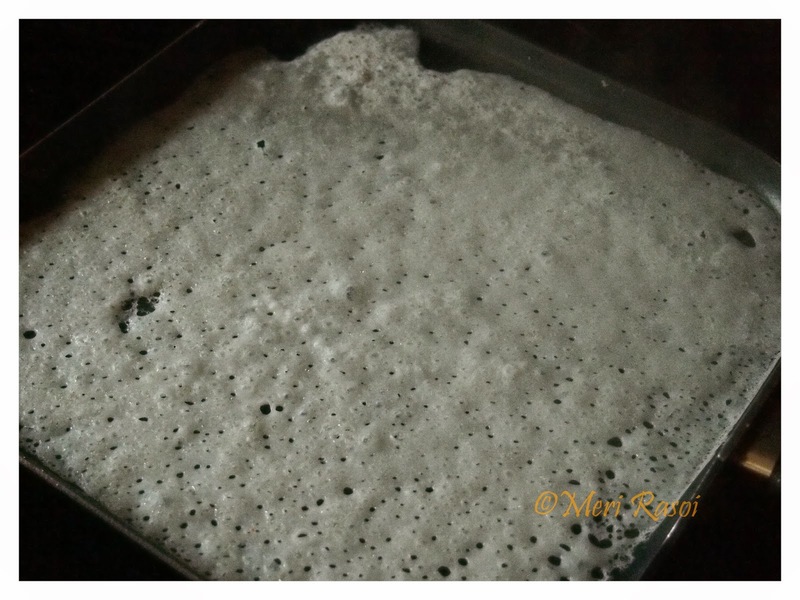 As soon as you pour the batter, you should see holes start appearing on the surface of the dosa. Let the dosa cook. After about 30 seconds or so, you will see the sides of the dosa lifting up. The dosa is ready to be removed. 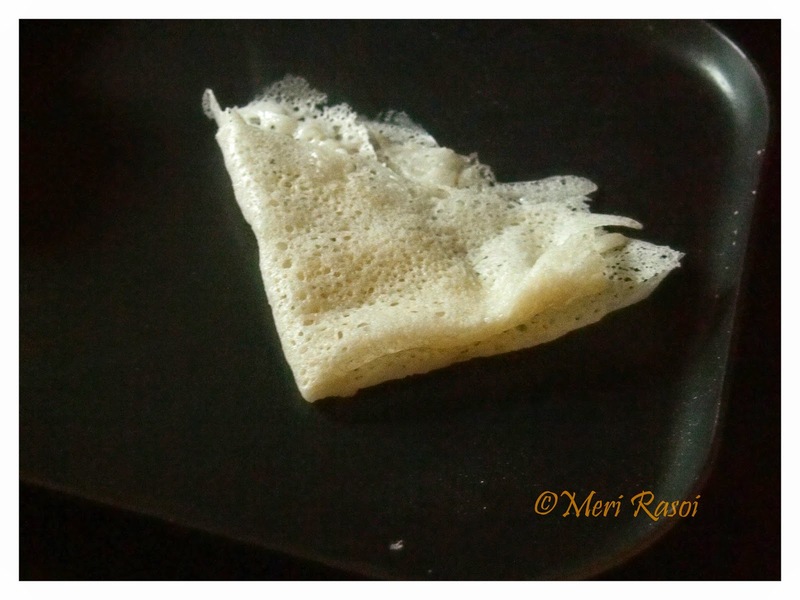 Gently fold the dosa into half and then give it another fold to get a triangular shape. Take it out in a plate. 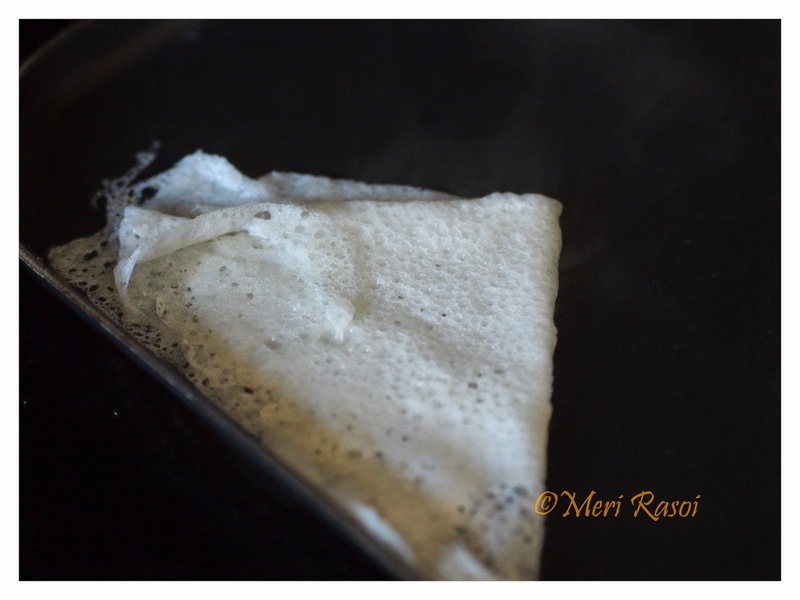 Note:You do not need to flip the dosa. Also this dosa has to be white so donot over brown the dosa. Remember not to stack the dosas when they are hot, then tend to stick. Once they are cooler, you can stack them. It is important to grind the rice coconut mixture in to a smooth paste by adding water little by little.Do not add a lot of water all at once because the rice will not ground smoothly in that case. When you touch the batter it should be completely smooth. It is advisable to soak the rice for atleast 4-6 hours or overnight. Use a well aged rice. I used SONA MASOORI rice. I have used non stick pan. If you are using an iron skillet, then season it will oil everytime you make dosas. Also rub the pan with piece of onion (cut the onion in half and use one half). The juices from the onion create a nonstick coating on the pan. Use the same onion to rub every time before making the dosa. The consistency of the dosa is important. If it is too thick, then the dosa will crack. 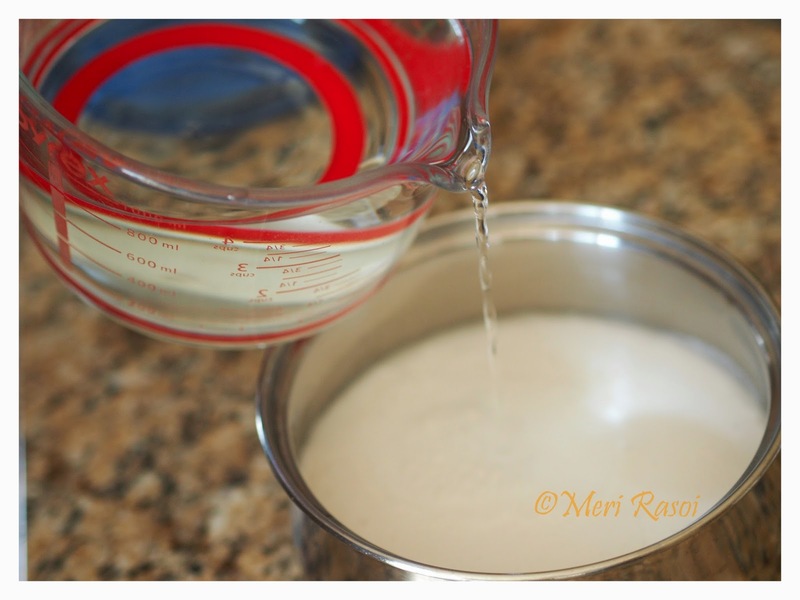 Mix the batter well every time you make dosa. The thicker batter tends to settle while the water remains of the surface. Hence , mix very well every time before pouring the dosa. The temperature of the pan is equally important. If the pan is not heated enough, then the dosa will crack . Do the sprinkle test. If the heat is right, as soon as your pour the batter, you will start seeing holes appear on the surface of the dosas. Do not stack the dosas when they are hot as they tend to stick together. you can stack them once they have cooled down. Lovely crepes. Not a fan of dosa but my other half simply loves it any time of the day. I am tempted over the chutneys. 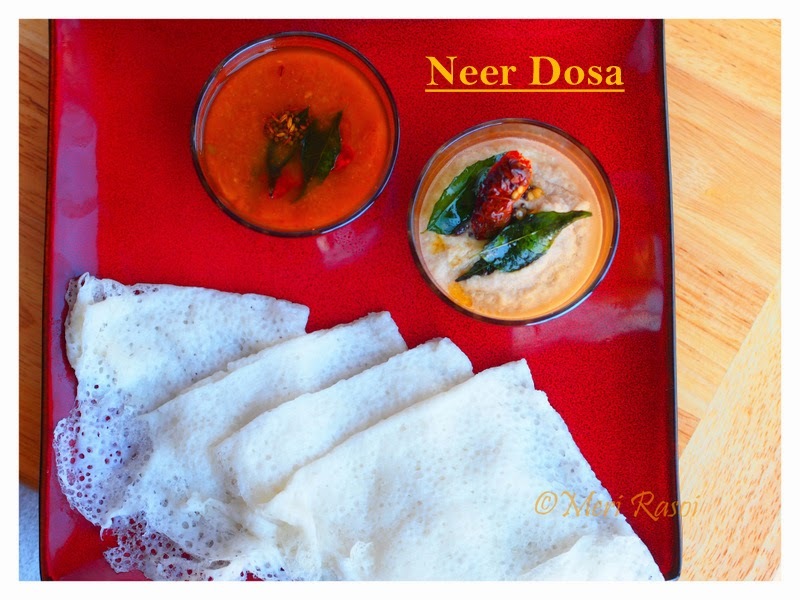 I have not tried neer dosa, sounds good & delicious, must try. Do try it Madhavi, let me know if you have any doubts..thanks!! 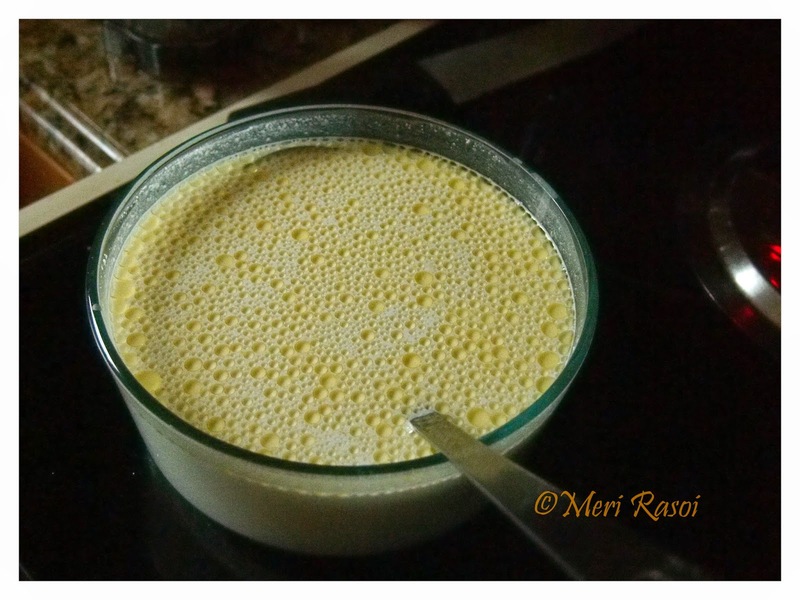 very well explained recipe and I'm sure will tempt anyone to give it a go straight away including me :) Thanks Shubha for sharing all the useful tips and this wonderful recipe. lovely step wise pictures too :) too good. Lovely neer dosa...adding oil to the batter is new to me..we have Neer dosa with any rasayana (mango or banana) or with jaggery added coconut milk...thats the special of this dosas.. I not only indulged myself visually but your very well put description of how to make the recipe was almost like a visual put forth. 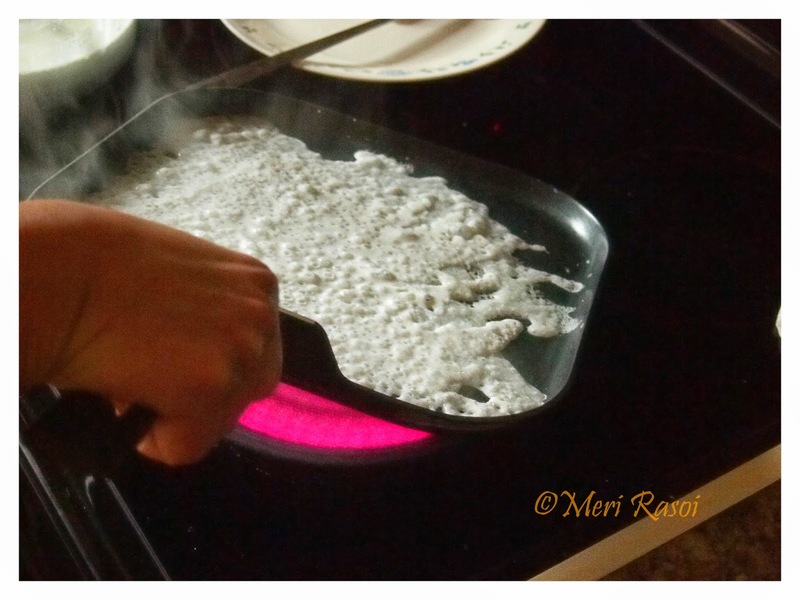 You didn't miss out on a single aspect including how to access the right temperature of the pan before pouring in the batter. These dosas are so soft and thin that it requires a pair of deft hands to get that perfect looking dozen. A very well worded post with equal pictorial delight. Very tempitng n delicious luking dosa.never tried n tasted. 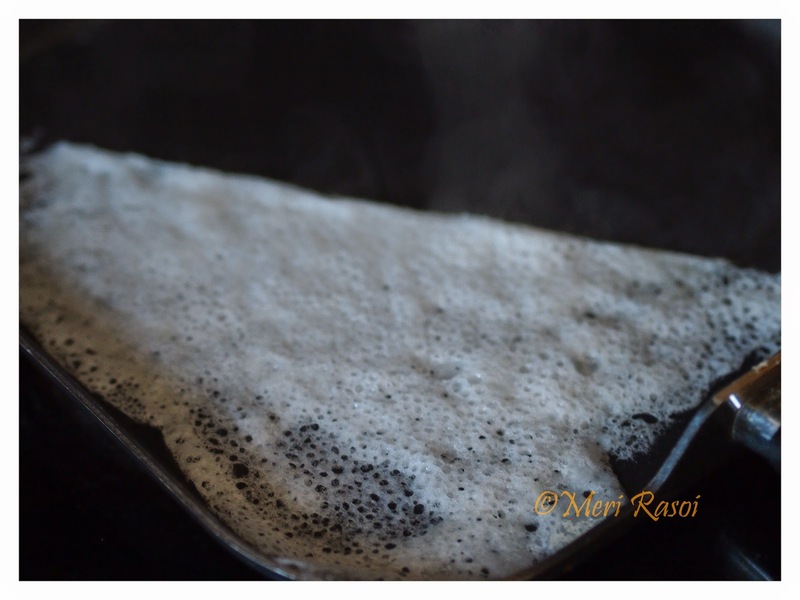 What happens if we use boiled rice for neer dosa to cook faster? Cos I tried to make once where I used 1 cup rice & boiled it, instead of soaking, due to lack of time. 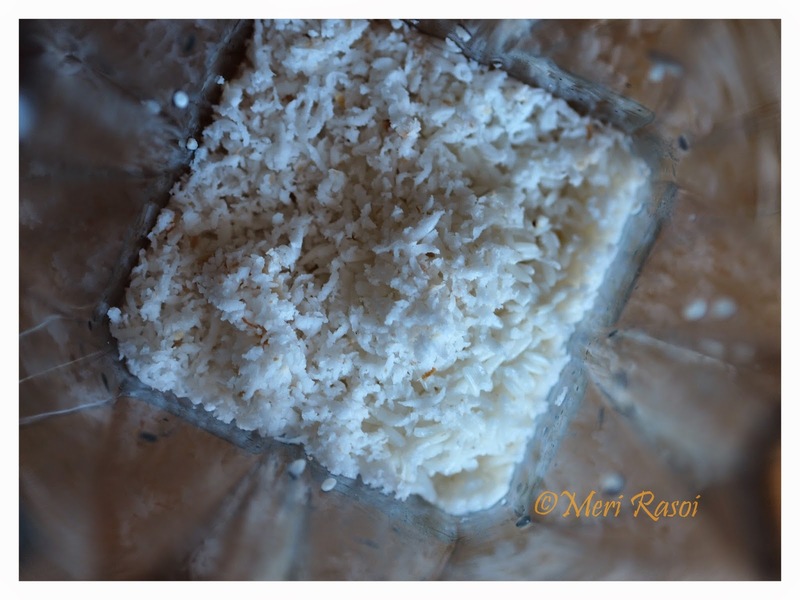 Then mixed Grated Coconut to it & grinded. 1st of all, as the rice was cooked to become tender suitable for normal consumption, where I felt the quantity now is too much to fill in the grinder. When I got it grinded, it was just like a chappathi batter thick as I forgot to add little water (Luckily my grinder did not get fire). So I added water & tried to mix. But, the thick batter was not getting mixed. It was slipping around in the water. So I mixed using grinder. Now, when I tried to pour it to the hot Pan & when covered with glass lid, I could see alot of bubbles rising from it & as the water content evaporates & become dry, it cracks & get sticked on the Pan as very very thin film, becoming hard to remove. Could you please help to find the mistakes?